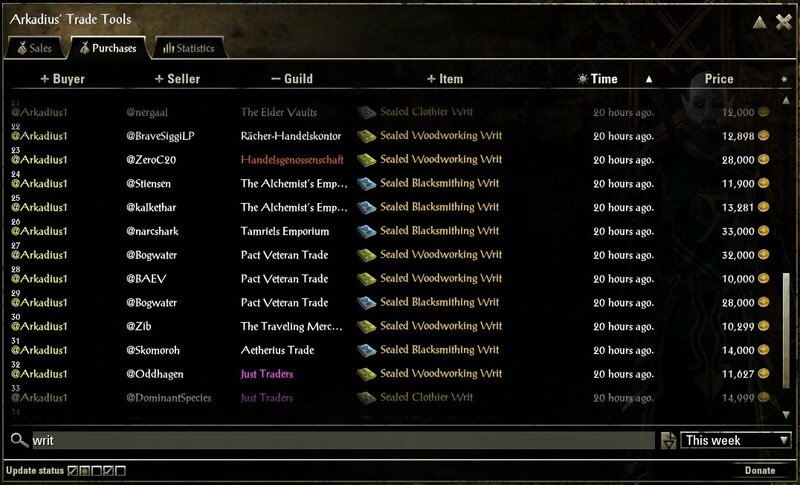 Arkadius' Trade Tools is a modular framework with the goal to provide traders with useful trading tools and information and to help trade guild masters managing their guilds. Each added module will extend the functionality of ATT in some way. Modules come as its own addons and can therefore simply be deactivated via the addons menu if not needed. Item tooltips are extended by the average price and a graph displaying the price development. The time frame for these calculations (1-30 days) can manually be selected. Item price statistics can be inserted into chat. For non-English clients there is an option to post the statistics in English. 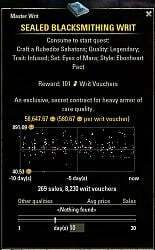 Sales are stored up to 30 days, depending on per-guild user settings. Most features can be enabled or disabled in the user settings. Sales scan rate can be customized allowing sales to show up in nearly real time. 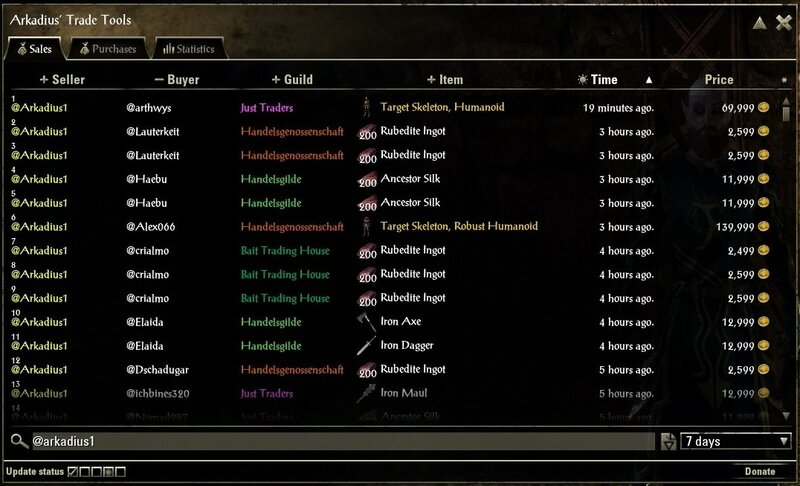 Functionality: Saves purchases the player makes from guild traders and displays them as a list. This module may especially be useful for resellers to remember what they payed for a particular item. Purchases can be saved up to 30 days. 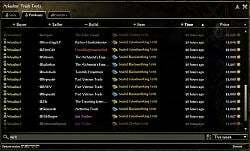 [FIX] Disabled guild store extensions for Awesome Guild Store users again. They were accidentally enabled in the previous patch. A real fix still has to be found. [NEW] This patch introduces the flrst step to display the average crafting costs for items required by master writs. This information is shown on the writ's tooltips. Others may be added at a later point. This feature is enabled by default and can be disabled through the addon's settings. 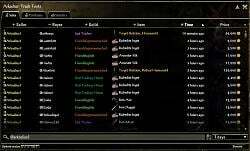 [UPDATE] Added compatibility for ESO update 21 "Wrathstone"
[UPDATE] Added compatibility for ESO update 19 "Wolfhunter"
Hey! Is there a way to see the total money spent in purchases in the week? Thank you! As soon as I disable some features (in this case, Seller and Buyer), my ui doesn't work anymore. No matter how big I put ATT's window, it wont show the price and ppu. In that case it might be benefitial if u could send that. Lua file to Arkadius via some upload or Dropbox, so he can check the line which is causing that error? I still can't reproduce your error. However, I added some extra check to something that might be the cause. I hope it works for you. The 1.1.1 update seems to have fixed the Alchemy master writ issue for me, yes - and Thank you! Seems like I'm not the only one, got this error too when using ATT and AGS. It pops up everytime I search for something. I get this sort of error too, but it depends a lot on what I'm searching for. I haven't nailed down a firm example yet that will "work" every time to reproduce this error. While I see why the lua error occurs (maxPrice = inf), I can't find the source for this error. As I also can't reproduce it, I need some help to track it down. 1. Could you please try if the error still happens, when all addons except ATT are disabled? 2. Could you please post a screenshot of a misbehaving writ's tooltip (plus itemlink, if possible)? 3. What client language do you use? Just to clarify: this error occurs for ALL my Alchemy master writs, and only the Alchemy writs, not for any other types. 1. Yes, I still get the lua errors with ALL other addons disabled. I did not check if the text was identical. Last edited by Pyr0xyrecuprotite : 03/28/19 at 06:37 PM. with the March 24 update, I get a lua error messages similar to those mentioned below, but only when mousing over an Alchemy master writ in inventory - doesn't happen for other master writs. I have AGS and I have the guild store extensions enabled (it happened before I enabled it too). With Guild Store Extensions turned off again, the message looks the same. I have not tried disabling AGS and Furniture Catalogue addons to see if things change. Last edited by Pyr0xyrecuprotite : 03/27/19 at 09:13 AM. 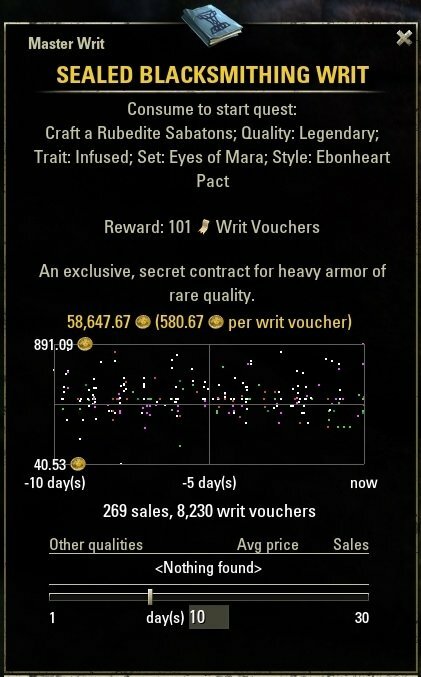 got another error this update, connected to master writs. Its linked to a clothier master writ (alchemy and enchanting dont cause errors). This error doesn't seem to be crafting cost but price graph related. Looks like either the min or the max price for that item is an invalid number. I will look into it.